I don't like blogging about Press Releases very often, but I was lucky enough to be given the opportunity to try one of Madara's products a few months back, which I absolutely loved, but was debating whether to purchase anything else, purely because they were, quite expectantly, rather on the pricey side. And, I try to stick to cheaper brands and products as much as I can, not only because I can't afford them, but because I've always tried to keep my blog in the "budget" price range. 1. Delicate Cleansing Milk. 25ml. Typically this comes in a 100ml bottle that costs £14, and it is suitable for all skin types. Ecoface organic delicate cleansing milk removes makeup, and gently cleanses the skin without causing dryness and irritation. ecoface organic delicate cleansing milk is suitable to use around the eyes. 2. Deep Moisture Fluid. 5ml. Costing £24, a full sized bottle of the Fluid contains 50ml and is suitable for normal to combination skin. MÁDARA ecoface organic deep moisture fluid is a natural and organic moisturiser to protect your skin from moisture loss as well as protecting your facial skin and neck from the harmful environmental factors - effects of sun, pollution and stress. MÁDARA ecoface organic deep moisture fluid will hydrate, firm, nourish and soften the skin, balancing oily and dry areas of your face and neck. After using this light fluid for a few days you will notice how soft your facial skin has become. 3. Regenerating Night Cream. 5ml. 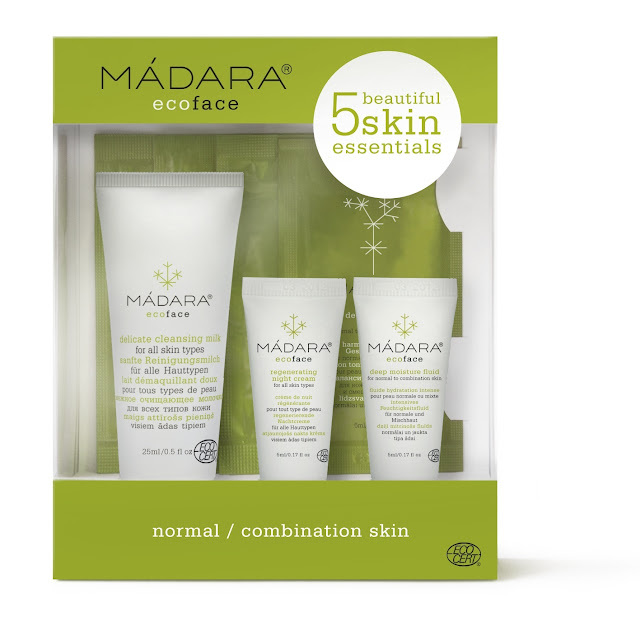 Madara offer two types of Regnerating Night Cream, both 50ml in size, however the "all skin types" product will set you back £25, whilst the product designed for "dry to very dry" costs £24. ecoface organic regenerating night cream is a moisturiser to help protect against the skin ageing process at any age and helps to stimulate cell renewal. Smoothes fine lines, repairs damaged skin caused by stress, sun and environmental influences. MÁDARA ecoface organic regenerating night cream hydrates and nourishes the skin while you sleep. Note: The product included is suitable for "all skin types". 5. Eye Repair Cream. 3ml. Suitable for all skin types, the Eye Repair Cream sells for £23 for 15ml. Ecoeyes organic eye repair cream is a rich textured deeply hydrating cream that firms, lifts and repairs skin in the delicate eye area. ecoeyes organic eye repair cream deeply hydrates and boosts natural collagen production. ecoeyes organic eye repair cream helps to minimise fine lines and wrinkles. Price: The Travel Set is selling for £6.95 from the Madara website and FeelUnique. Initial Thoughts: I haven't tried this set, but, my initial reaction is that if you really want to try Madara out, but aren't sure if you want to spend that kind of money, or can't afford it, then this travel set seems to be the perfect alternative, not only as something to shove in your overnight bag, but to generally give the brand a try. "The set is indeed for normal to combination skin and it can be used for oily skin as well, as the products are gentle and don’t stimulate sebum production. However, if you suffer from severe acne, then I wouldn’t recommend some of the products – I would then opt for the Deep Cleansing Foam (instead of Creamy Cleanser) and the Deep Moisture Gel (rather than Deep Moisture Fluid)." Fortunately, I don't have acne prone skin, so I decided to give the travel set a whirl, and I'll (fingers crossed) have a proper review for this when I receive the products.